The Artec VPL-1 Active Volume Pedal has a lot of great features like minimum and maximum volume controls and 2 outputs (1 fixed gain and 1 adjustable gain.) where you line-in a tuner without worry on the pedal positioning. 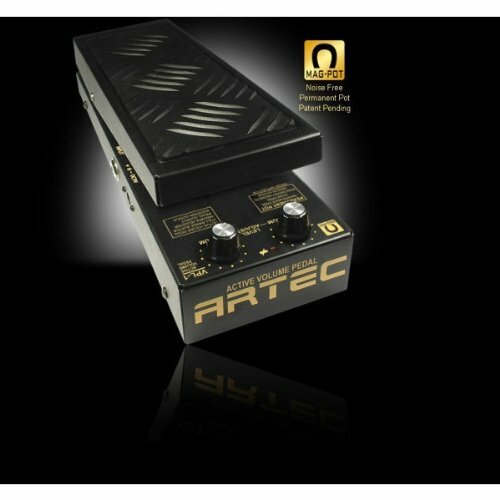 This pedal also features Artec's magnetic, noise-free "permanent pot" which eliminates the interference that you might hear with a normal pot and and an effortless "no Click" response. Very nice control here for all types of music and tonal swells. Features at a glance: Active volume pedal. Ingenious level-adjustment. Maximum-Pot: controls the value at down position of the pedal (at neutral position Input=Output, no boost. Minimum-Pot: controls the value at clicked up position (at zero muting occurs). Sturdy sheet steel casing. Mono-plugs input and output. Additional Fixed-Gain Output (f.i. for tuner). Power supply: 9-V battery or 9V power supply. LED for low battery level. Minimum and Maximum volume controls. For all types of music and tonal swells.